Everyday Heroes — A Keynote And Performance. Everyday we are the heroes of many fascinating stories. But often we don’t even notice. We slide past our triumphs; we ignore our acts of courage and we downplay our insights. 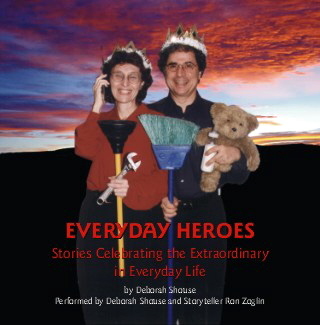 EVERYDAY HEROES, a performance by Deborah Shouse and Ron Zoglin, invites you to see yourself and those around you as everyday heroes and inspires you to take an innovative and humorous look at the stories of your own life.